Sony's newest budget Alpha DSLR's have been leaked dry, leaving nothing to mystery for today's official announcement. Really, nothing. So here are some new pictures! To refresh your memories, Sony's new line of DSLRs isn't a massive departure from their previous models. The a230, a330 and a380 roughly replace the a200, a300 and a350, putting a decidedly consumer-oriented spin on the cameras. That means they're smaller, the interface is simpler, the styling is a bit smoother, and that they now accept SDHC and Memory Stick Pro cards instead of the previous lines' Compact Flash. This also means that they inherit the same old 10.2 and 14.2 megapixel tiering, the latter relegated to the higher-end a380. In addition, all models get a 2.7-inch LCD Liveview screen—a tilt/swivel version for the 330 and 380, as well as HDMI output for displaying photos on HDTVs. Pricing isn't terribly enticing—$550, $650, $850, respectively—but we'll have to see how these things perform before we make any judgments. Also detailed are a few new accessories: new telephoto, zoom and portrait lenses, and a budget flash unit. (something the Alpha line dearly needed.) Full release below. 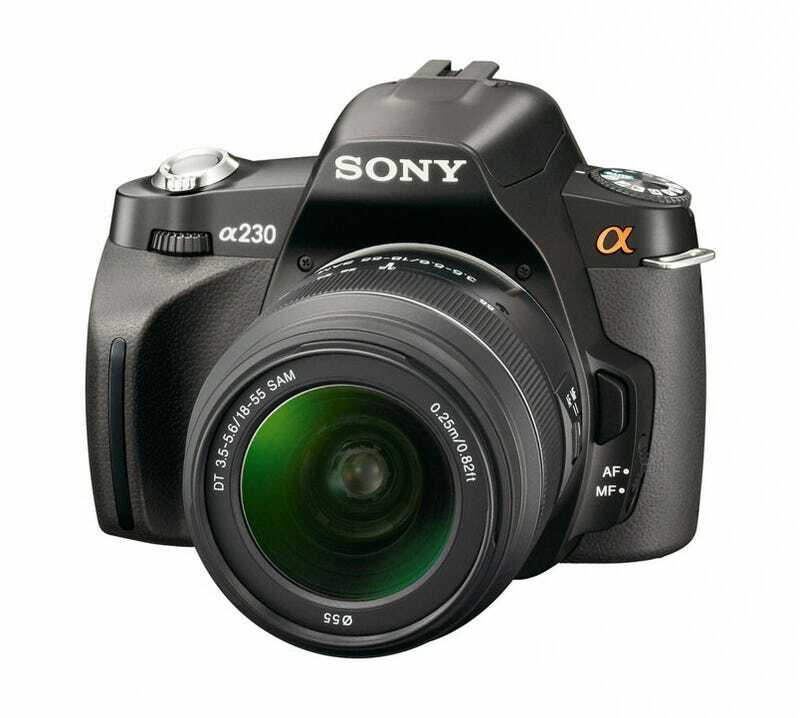 Both the α380 and α330 cameras offer Sony's Quick Autofocus (AF) Live View technology, so you can frame photos on the camera's LCD screen as well as in the optical viewfinder. Through the use of a dedicated image sensor, Quick AF Live View maintains the rapid response of a DSLR, while avoiding the focus delay common to other live view systems. An HDMI™ terminal gives you the option of connecting your camera to a compatible HDTV and playing back your images in high definition quality (HDMI cable required, sold separately). Additionally, BRAVIA® Sync™ works with compatible Sony® BRAVIA HDTVs to let you control camera playback using the television's remote (HDMI cable and BRAVIA Sync capable HDTV required, sold separately). The new cameras include dedicated slots for high-capacity Memory Stick PRO Duo™, Memory Stick PRO-HG Duo™ and SD/SDHC media (sold separately). The α380, α330 and α230 models are Sony's first DSLR cameras to feature a graphical user interface (GUI) with built-in on-screen Help Guide. Making it easier for first-time DSLR users to get started, the new Sony cameras come in camera-and-lens packages. In addition to the two new standard zoom and telephoto lenses that are offered with the camera bodies, the company introduced new portrait and macro lenses. These purpose-built lenses make it much easier to obtain professional-looking, creative results. Optimized for use with APS-C sized image sensors, these lenses feature a Smooth Autofocus Motor (SAM) that enables in-lens auto focus (AF) drive for smooth, quiet operation, and high optical performance in a compact size. To help users take better shots with flash, Sony offers an affordable, compact external flash unit (model HVL-F20AM) that is simple to operate. Unlike a camera's built-in flash, this external flash provides higher output (Guide Number 20), and enables users to bounce light off the ceiling to eliminate harsh shadows and achieve more even illumination when shooting indoors. Pre-orders will begin on May 18, 2009 at HYPERLINK "http://www.sonystyle.com/retail" www.sonystyle.com/retail and at selected retailers nationwide. The cameras and a range of accessories will be available in July at Sony Style® retail stores (www.sonystyle.com/retail), at military base exchanges and at authorized dealers nationwide.